My ex-student Erin had told me all about her new school in Melbourne after she moved back home. A big part of my original reason for making the trip over to Australia was to see Erin and train at her new place. There was therefore quite a lot of expectation riding on what she'd said: as it turned out, those expectations were more than met. 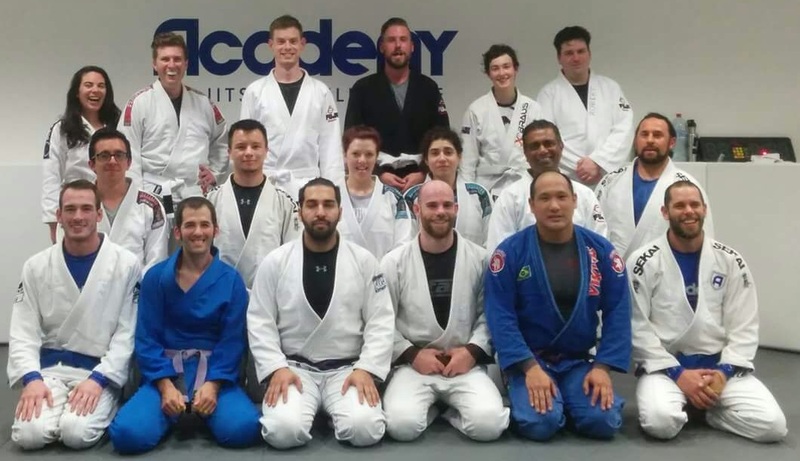 Academy Jiu Jitsu is a lovely place to train, full of friendly people who immediately made me feel part of the family. In many ways it reminded me of training back home at Artemis BJJ, so I wouldn't hesitate to recommend Academy Jiu Jitsu if you're looking for a chilled out training environment with a friendly vibe. The rolls were technical, everybody was welcoming, lots of laughter during class. The teaching was high quality too. Dylan went through a standard closed guard break and pass, with lots of details. Sit on your heels, thrusting your hip. Use your forward hand to grasp both collars, twist: that's to keep them down. Other hand grabs their wrist, pressing that into their hip. Slight flare of your elbow in order to press in their hip, but be ready to clamp that back in as it's dangerous (omoplata etc). To stand, lean over to the non-wrist grip side, then step your wrist grip side foot forward. Stand, letting go of collars and pulling up on sleeve. Dylan likes to switch grips, but down to preference. Squeeze your knees together, then push down on their knee. You can follow with your shin and move into various passes. One I hadn't thought about was windscreen wiping your feet across, then you can go into mount, side control etc. In closed guard specific sparring, I was lazy and just waited. It's important to be wary of chokes, I was lucky in that i could push on elbows to prevent the chokes, but if he had gotten deeper, that would have been on. I liked the simple tip that if they grab your collar, grab their hand and use that as your grip to stand. Worked well for me.a few times, but just white belts and I was telegraphing it too much. Next up, open mat.